Fort Sumter. Bull Run. Antietam. Vicksburg. Gettysburg. Appomattox Courthouse. These are the places you usually think of when you think about the Civil War. Not Milwaukee, Detroit, Indianapolis, Chicago, Minneapolis-St. Paul, Des Moines. And yet the newly developed Upper Midwest played a decisive role in the war between the North and South that in the final tally not only preserved the Union, but ended slavery. Some 750,000 sons, brothers, fathers, and friends marched away from their homes and farms in Illinois, Indiana, Iowa, Michigan, Minnesota, and Wisconsin to serve on faraway battlefields, something like one in eight residents. It wasn’t a universally popular war in those states—an anti-draft riot in Port Washington, Wisconsin, was the first significant anti-war disturbance in the country. But Midwesterners answered the call to defend the Union and to win recognition as full partners in a union of states that they had joined just a few decades earlier. These men in those frontier military regiments were a curious mix of backgrounds—sons of New England and Pennsylvania and Ohio and New York, and even Virginia, Tennessee and Kentucky, as well as children of Germany, Ireland, Norway, and other places. In some of the backwoods volunteer companies could be found one or two free blacks and slave runaways as well as representatives of the Ojibwa, Oneida, Potawatomi, and other tribes—all to carry a musket with the rest. There were all-German and all-Irish units sent from these Upper Midwestern states, and even a company of Ojibwas in a Minnesota regiment. The 15th Wisconsin was composed almost exclusively of Norwegians, 115 named Ole. Not infrequently, every civilized nation on the face of the earth was represented in the rank and file of the same regiment. Every condition of social, religious and political faith, all the trades, occupations and professions were represented. The same tent covered the banker, lumberman, medical student, lawyer, merchant and machinist. The millionaire’s son touched elbows with the son of his father’s hired man. The nation’s population shift began at the end of the Revolutionary War, when the land west of the Appalachian Mountains beckoned. It soon led to the formation of the new states of Indiana, Illinois, Michigan, and Wisconsin, and that brought more settlers, men and women of ambition and vigor interested in making a future. It mattered not if they came from Ireland, Germany, England, or other places across the sea, or from more established states. Life on what was then a harsh frontier forever changed and shaped them. “They were young men and women in their very prime; a sturdy, stalwart, self reliant element such as pushed out to develop a new country … their superiority was noticeable,” William Herndon, Abe Lincoln’s law partner, wrote of his neighbors. Lincoln himself made his way from Kentucky to Indiana to Illinois, where he married well and became a lawyer of repute. Like Sol Meredith, who walked out of North Carolina to prosper and grow strong in Indiana political circles, and two brothers named Clayton and Earl Rogers, who came from Pennsylvania to the new Wisconsin territory to open a sawmill “10 miles from the nearest white woman,” the settlers on the new frontier, Herndon said, could raise families and build a future, as well as drain a marsh, clear a field, and even create a state. 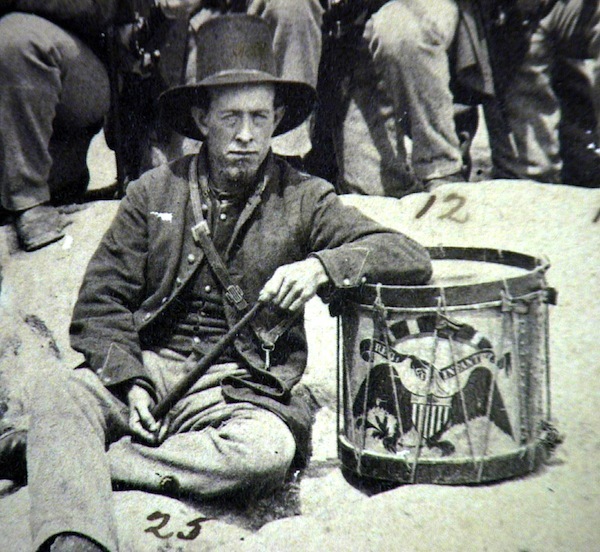 A Wisconsin soldier of the famed Iron Brigade looks confidently into the lens of the camera while home on veteran furlough in 1864. He is not identified. In the final tally, the Union was restored not only by blood, but by the growing industrial and agricultural might of the Upper Midwest. Those people left behind produced massive amounts of foodstuffs and materials they moved over hundreds of miles of river and rail to the war front. Midwestern farmers produced wheat, corn, and oats as well as butter, cheese, and livestock needed to feed the soldiers. Raw materials such as copper and iron ore were mined to supply new shops and factories. In Michigan, vast amounts of wood were used to produce salt needed to preserve tons of meat. From there and from other Upper Midwest states came the lumber needed for artillery limbers and musket stocks. Wisconsin mines produced lead for bullets and state tanners cured the leather needed for animal harnesses and military belts. Indiana mills ground wheat into flour, and Hoosier factories made the wooden barrels needed to store salt pork and beef. Illinois river towns became military staging areas. The women left behind sent food in large amounts to their sons, husbands, and fathers in faraway army camps, staged large fairs to raise money for the wounded or support the families of those in uniform, and visited the army hospitals near the battle areas to serve as nurses. It was that stunning display of cooperation, ability, and industrial might by the diverse, swirling, and ever-changing population in the Upper Midwest that would manifest itself again and again over the next 150 years in even larger military conflicts involving the United States. It is just as certain now, as it was from the very beginning, that America is ever-changing and evolving—always a place of new beginnings and fresh starts. Abe Lincoln, who split rails to make fences as a farm boy in rural Illinois and climbed to the highest office in the land, benefited from a more sweeping, more modern vision of the nation acquired in his days on the frontier. That understanding helped him forge a victory in a civil war of unexpected fury and magnitude, and that is why his address at a cemetery dedication at Gettysburg still echoes a century and a half later. In so many ways today we are still working on what Lincoln called “a new birth of freedom,” and his simple words remind us, as we go about our own lives in a world of growing complexity and danger, that freedom and hope and a future are bought with sacrifice, hard work, and, yes, even understanding. 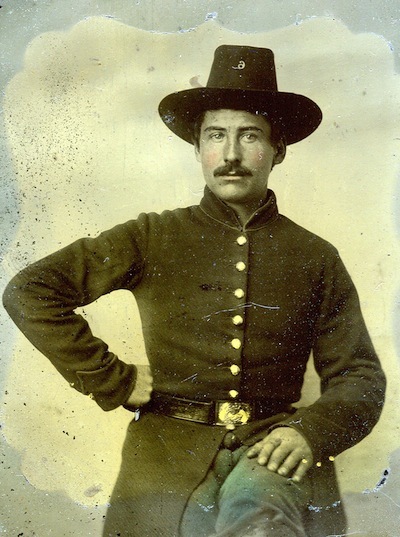 is chair of the Wisconsin Civil War Sesquicentennial Commission and the author of The Iron Brigade in Civil War and Memory: The Black Hats from Bull Run to Appomattoxand Thereafter and Those Damned Black Hats! : The Iron Brigade in the Gettysburg Campaign. He is the historical consultant for the Civil War Museum in Kenosha, Wisconsin. Lead photo and first interior photo courtesy of Institute for Civil War Studies, Civil War Museum, Kenosha, Wisconsin. Second interior photo courtesy of Lance J. Herdegen. Lead photo: Soldiers of the Sixth Wisconsin Volunteer Infantry Regiment pose while encamped opposite Fredericksburg, Virginia, in the summer of 1862.